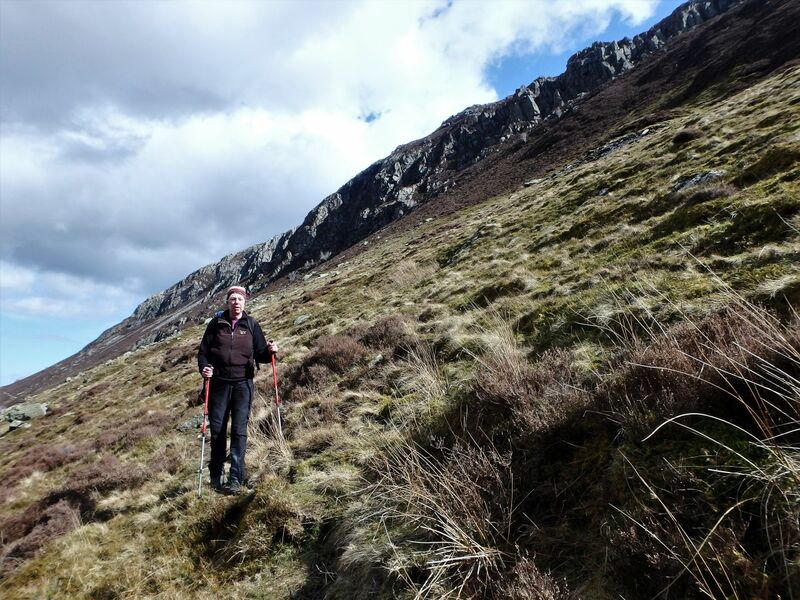 The mountains of the Carneddau in Snowdonia are big and wild, like a mini version of the Cairngorms, and a mountain trip in the Carneddau is usually going to feel like a big one. 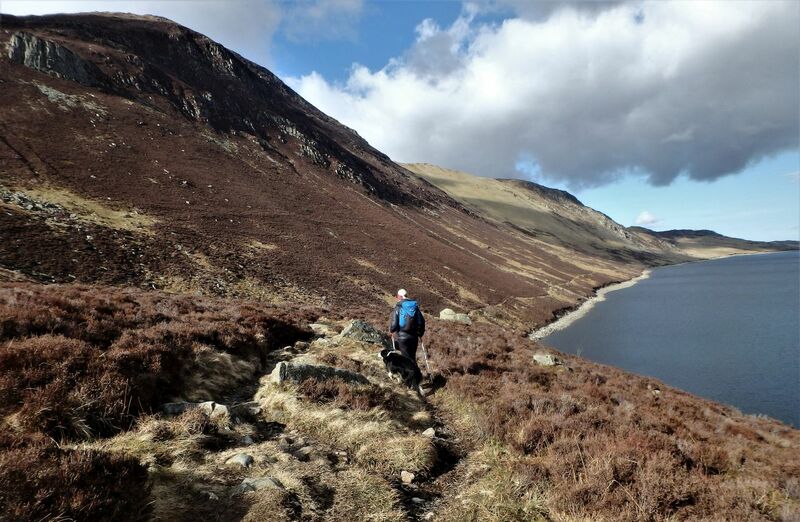 Since we moved to North Wales in 2012, I’ve had some of my best mountain days in these hills, one of the best being a crossing of the range from end to end in 2014 (see post #160) – now that was definitely a big day! 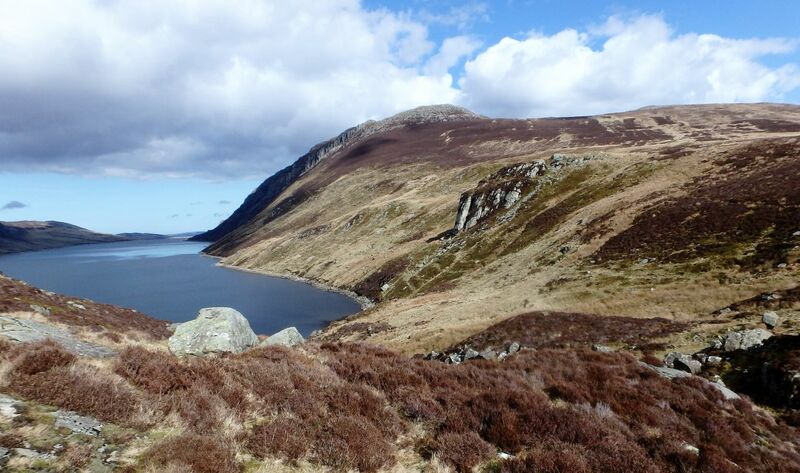 Regular readers will know that ‘me missus’ prefers her mountain days in smaller chunks, but there’s so much to go at in the Carneddau that I can usually come up with a less-committing option. 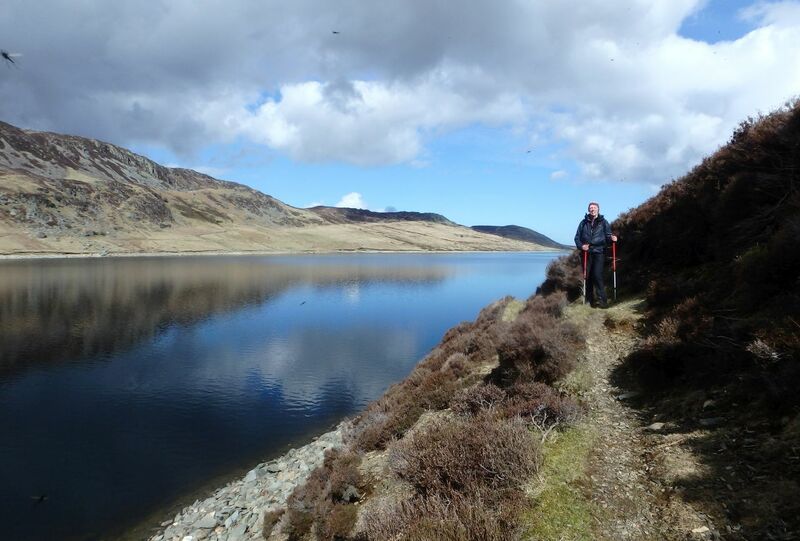 A year earlier we had enjoyed a day heading out to Drum via Llyn Anafon (see post #219) but I had something else in mind this time, a circuit of the wild and lonely lake of Llyn Cowlyd. 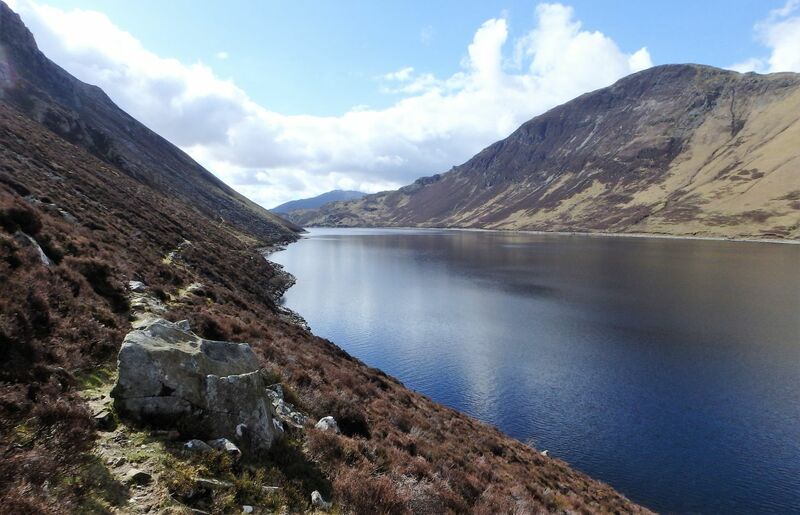 Snowdonia is one of the wettest places in the UK, so the occasional lake shouldn’t come as a big surprise. 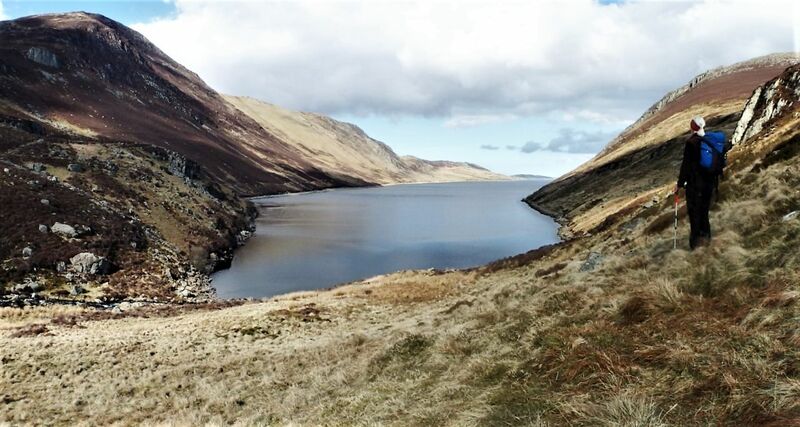 What is a surprise though, is that many of the lakes are dammed, including the lovely Llyn Cowlyd, and the start of the walk was dominated by an ugly pipeline leading up to the dam. 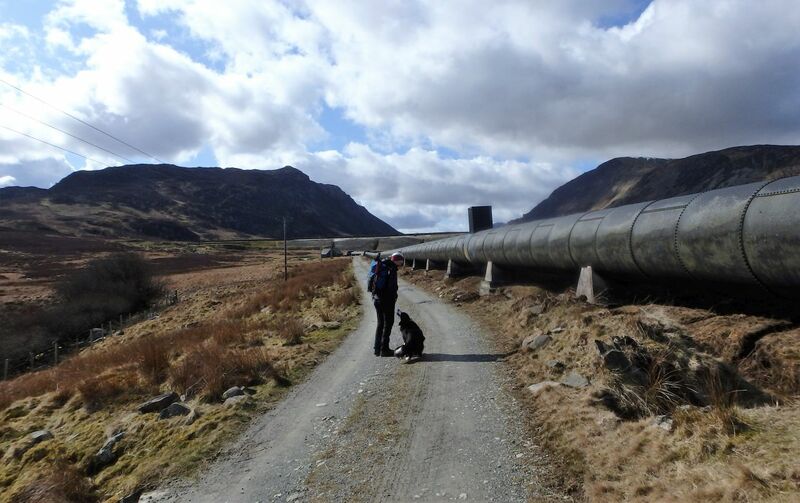 This feeds the power station at Dolgarrog in the Conwy valley, with other buried pipes carrying drinking water to Conwy and Colwyn Bay. 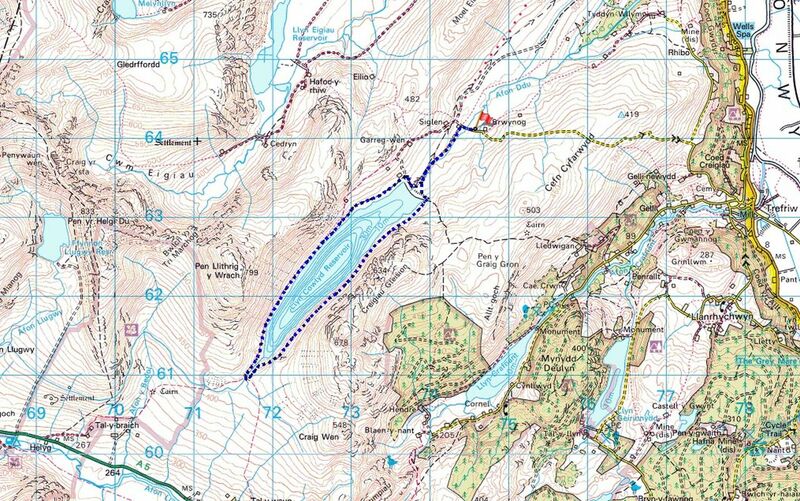 The plan was to follow the path (not shown on the map) along the southeast side of the lake, returning by the better path on the northwest side. 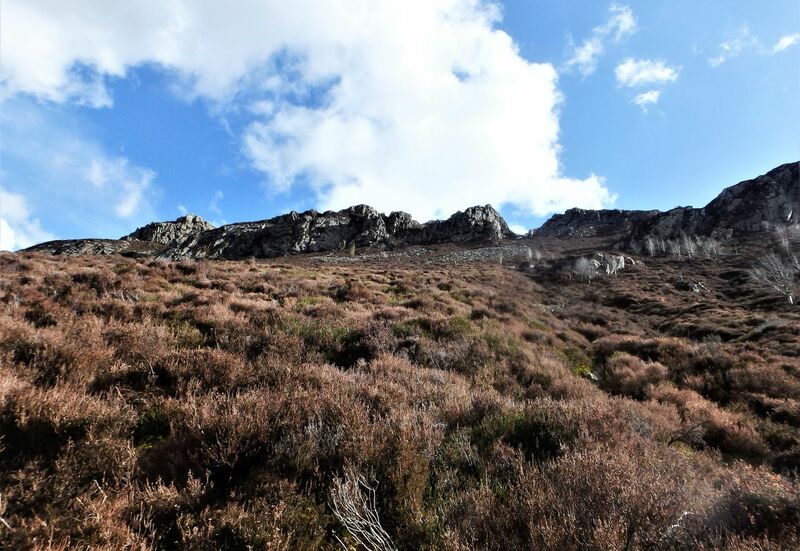 Dominating the view ahead was the wonderfully named Pen Llithrig y Wrach, otherwise the ‘Slippery Hill of the Witch’ (see post #77) and the narrow path was overshadowed by the rocky ridge of Creigiau Gleision (see post #173). 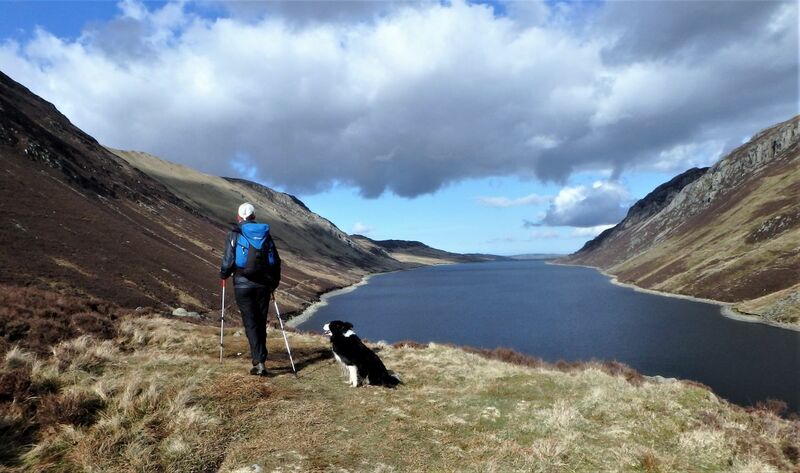 Looking across to the return route …. …. 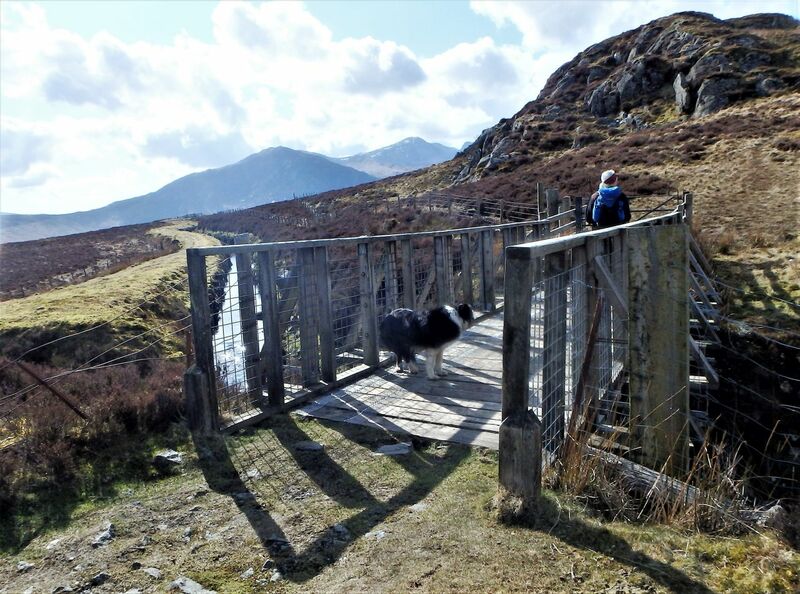 but there’s a stream to cross first …. 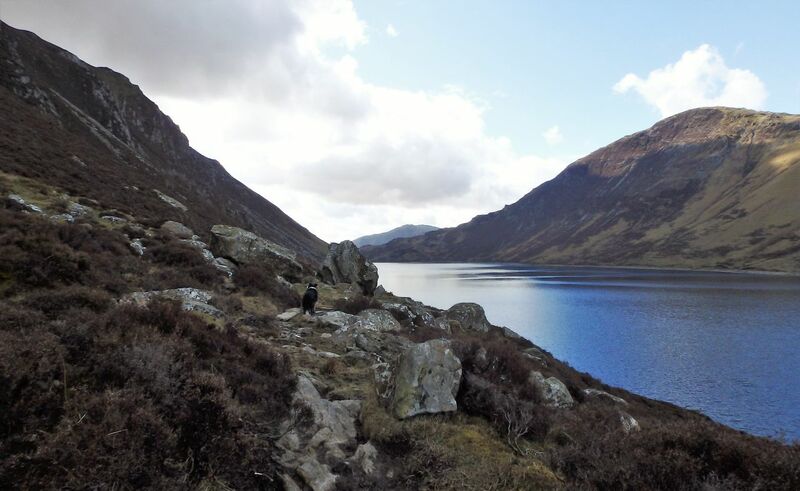 The path we followed was as lumpy and bumpy as I had expected it to be, but steady walking munched away the distance as we walked alongside the deepest lake in Wales (70 metres / 229 feet deep). 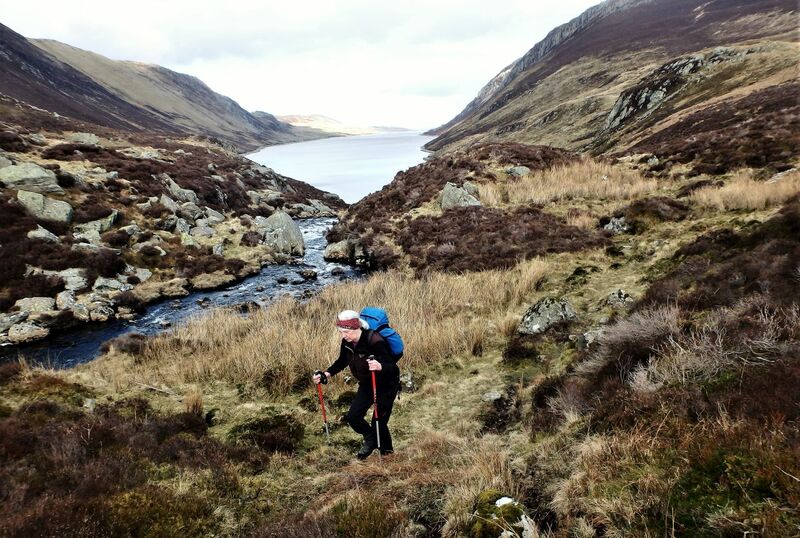 On the opposite side of the lake we were overtaken by several Duke of Edinburgh Award groups, who had the advantage of a better path, and at the head of the Lake we crossed the stream to find easier walking on the northwest side. 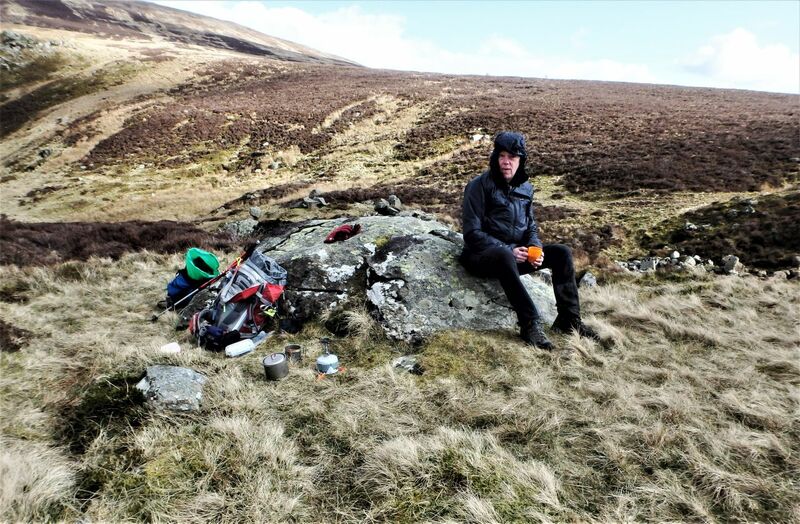 A quick ‘brew’ was indicated before the walk back – I carry a lightweight stove on my outings with Chris, and a fresh cup of coffee, tea or chocolate beats something out of a flask. A cool breeze meant that we didn’t hang around for too long, and a more pleasant path took us below the slopes of the Witch’s hill. Didn’t see the witch, nor did we see the fire-breathing bull said to live in the lake – probably just as well. 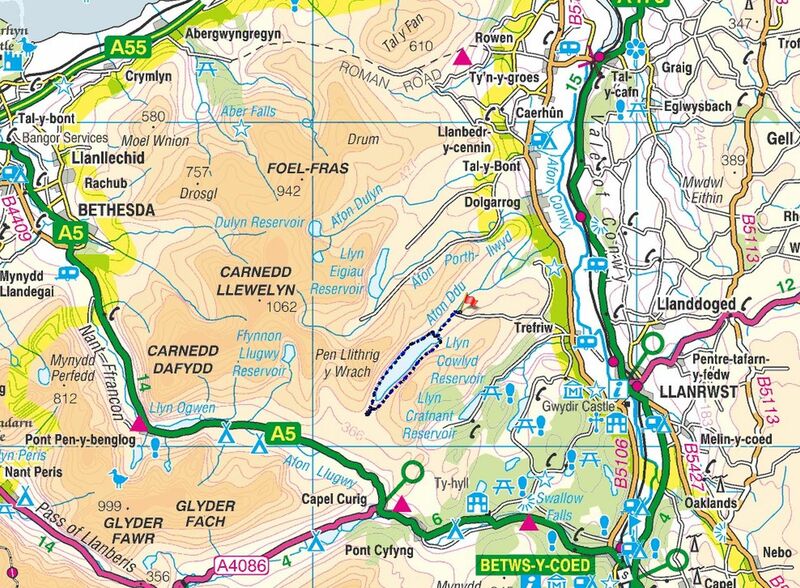 Have been around bits of the llyn but never the whole thing – I never mind infrastructure stuff so long as it’s necessary really… Didn’t know that was Wales’ deepest llyn!